I’m interested in history and culture. Often I’ve wondered what life was like a couple hundred years ago. There was no electric lighting to fill the night, yet there are always places for people to visit at night. Btw, did you know that many centuries ago, performers in geisha houses would paint their faces white so customers could see them better on stage? It’s interesting how these traditions begin. I confess to watching samurai movies every time they have them on television. But generally I like the kind that came out of Japan after World War II, mostly the Janus films. Usually these movies contained scenes of castles, fine homes, and villages, but occasionally they’d portray activities in sake houses and kiosks. And once in awhile you find scenes shot inside authentic geisha houses; these fascinate me! I’ve studied these scenes and while they vary quite a bit, one theme seems constant, the intimate nature of the setting. These aren’t bawdy houses, they are beautiful and gentile. Ok, yes, some filmmakers create some scenes with violence but generally there seems to be respect these havens. When I designed my new geisha house, the Harvest Moon Café, I made provision for only a few guests at any one time, so to preserve that gentle milieu. and the ochaya comes to life. So, imagine you are a wealthy business man or samurai, back in the Edo period of Japan. If you are a man, imagine that you know you’ll always be treated with the highest respect and waited on by women whose only role is to delight you with their beauty and conversation, and with entertainment and their personal service. Not a bad way to live if you are a guy and have a lot of money. He may have a wife and children at home but he can leave all that behind. Here’s the thing that attracts me to being geisha, you can always find safety for your heart because you are always playing a role. When the men are there, you play your role; when they leave, you can live your life and they disappear from your thoughts. No emotional entanglements. For some women this will surely sound sickening, but for me and, I imagine, for most geisha and apprentice geisha also, this works. In a world without electric light, the ochaya’s lamps are life. And the geisha house is a haven of light and warmth and joy. “She paints her face to hide her face. Hmmmm… I just might finish my geisha stories yet! 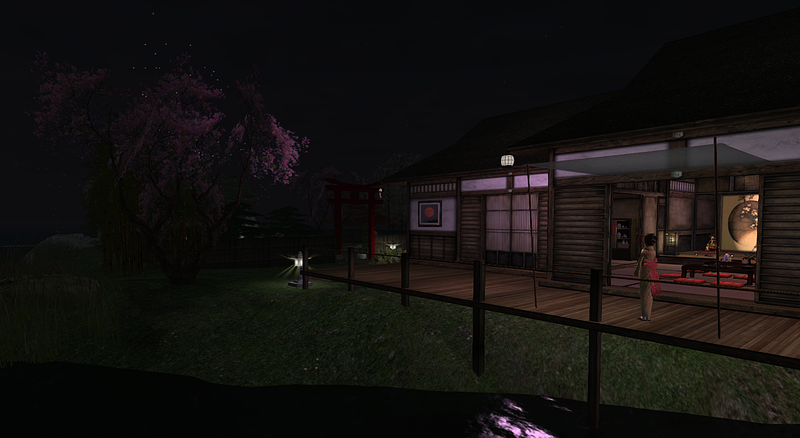 This entry was posted in Features and tagged Geisha & Samurai, Identity, Role Play, Second Life, Virtual Fantasy Life. Bookmark the permalink. I read a,lot about your geisha house. I hope I can visit it some day. But what are your geisha stories? Is it something private or can it he read somewhere? Hi Jaquelline… In 2010 I wrote a role play story called “The Samurai & The Geisha”. It was written very quickly as part of my blog then quickly collected into an e-book. Unfortunately, there were many inconsistencies and I’ve been rewriting it. As part of the rewrite I’ve written some stories, 100-word stories, that help create the setting. Here’s a link to five of six of the stories… https://yordiesands.com/my-stories/geisha-samurai/ One of the stories is part of a collection but i’ll post it here someday soon.